Every veterinarian has a favorite disease process or a type of health problem. Some love the gastrointestinal tract, others the heart or lungs. For me, conditions affecting the immune system and blood truly get me excited. As part of an appropriate diagnostic process for such conditions, sampling the bone marrow of our fur babies is often necessary. Unfortunately, many pet parents are scared by this procedure. This week, I’m sharing some information about bone marrow sampling to help allay fears. Happy reading! Bone Marrow – What is it? As a veterinarian interested in immune-mediated conditions of the blood, I frequently evaluate bone marrow to assess hematopoietic stem cells in red marrow. Indeed, this is the reason most veterinarians sample bone marrow. The process of developing red blood cells, white blood cells, and platelets is called hematopoiesis. Hematopoietic stem cells are constantly dividing and producing new cells. Many of them progress through various maturation stages to ultimately be released into circulation. White blood cells survive in circulation only for few days (and sometimes only for a few hours) while red blood cells typically circulate for 120 days. Thus, these cells must be continually replaced. Without a properly functioning bone marrow, this replacement doesn’t happen. Many organ systems become dysfunctional, oxygen transport throughout the body is disrupted, and a patient’s ability to effectively fight infection is compromised. 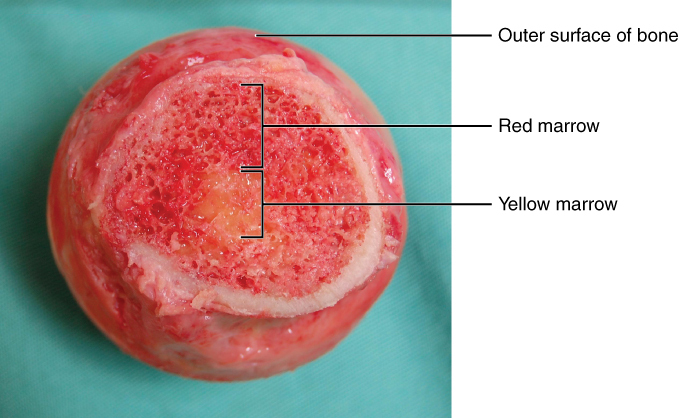 Bone Marrow – Why would my veterinarian want to sample it? 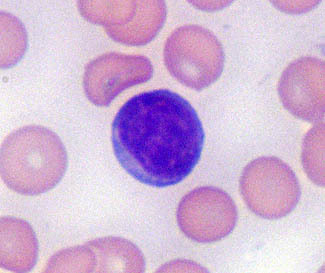 Mature cells with atypical morphology – red blood cells, white blood cells, and platelets mature in the bone marrow before they are released into circulation. If mature cells appear abnormal, then a maturation process in the bone marrow may be defunct. Certain cancers may be occult systemically but have a marked marrow presence. Thus, a veterinarian will recommend evaluating bone marrow in patients with a suspected cancer in the bone marrow. The doctor will also concurrently evaluate blood with a non-invasive test called a complete blood count. A thorough diagnostic investigation is of paramount importance, and partnering with a board-certified veterinary internal medicine specialist can be uniquely powerful to help determine the underlying disease process. 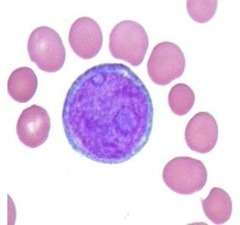 An immature lymphocyte called a lymphoblast (blue/purple cell) surrounded by several mature red blood cells. Lymphoblasts in circulation indicate the bone marrow is diseased. Bone Marrow – How is sampling performed? 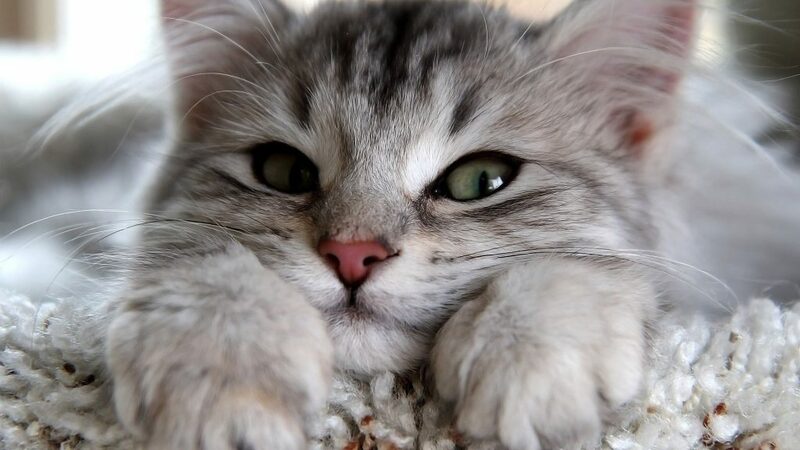 The veterinarian will advise as you as to the most appropriate sampling location based on your pet’s history, suspected disease process, and type of sample needed. Sometimes the veterinarian will aspirate fluid from the bone marrow; other times the doctor may remove a core of tissue (biopsy). Often, a veterinarian will collect both types of marrow samples to gain the most information about a pet’s condition. 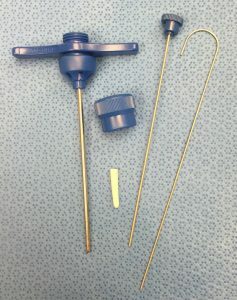 The sampling procedure itself takes only a few minutes, and thus it is an out-patient procedure. Complications associated with bone marrow sampling are rare. Occasionally mild-to-moderate reddening at the sampling site is noted. Excessive bleeding is uncommon. Inflammation and Infection at the site of sampling is possible but quite infrequent. The veterinarian should thoroughly review the risks of sedation and the bone marrow sampling procedure with you. Bone marrow sampling is an essential procedure for the examination of various blood disorders in dogs and cats. Obtaining quality specimens is unquestionably important. information gained from bone marrow sampling allows veterinarians to logically and appropriately prescribe medical interventions for patients.